This entry was posted in Government Tyranny and tagged "Barack Obama", "Executive Fiat" on May 25, 2014 by Shayn Roby. in which the video shows that Mr. Baer was arrested for a minimal amount of disruption. Given the vulgarity of the book, and the obvious breach of trust by the school officials, it would appear that the arrest of William Baer is a bit on the tyrannical side. This entry was posted in Christian Values, Communist/Socialist Agenda of Public Education, Government Tyranny, Liberal Zombies, Lucifer's Followers and tagged "Freedom of Religion", "Immoral Public Education", "Pornographic Literature", "William Baer" on May 7, 2014 by Shayn Roby. Shayn Roby’s Take: The reasons behind the tyrannical overreach by the Bureau of Land Management are definitely questionable as multiple liberal politicians have their fingers in the green energy pie. Conservative groups are justified in standing up against this extended arm of the criminal syndicate more commonly known as the Democratic party. This entry was posted in Government Tyranny and tagged "Bureau of Land Management", "Cliven Bundy", "Green Energy Corruption", Harry Reid on April 22, 2014 by Shayn Roby. Shayn Roby’s Take: In an interesting turn of events, tyrannical Agenda 21 supporting, land-grabbing Communist Harry Reid accused Cliven Bundy and his followers of domestic terrorism. This entry was posted in Agenda 21, Government Tyranny and tagged "Cliven Bundy", "Communism", "Domestic Terrorism", Harry Reid on April 18, 2014 by Shayn Roby. Bureau of Land Management Told, “YOU Need to Leave, Immediately.” They did. In this video that was uploaded to the Alex Jones Channel by Infowars.com, Bureau of Land Management Rangers are warning ranchers and protesters that they need to leave or they will be shot. The courageous protesters responded with, “NO, YOU need to leave, IMMEDIATELY. The Bureau members retreated and left. This entry was posted in Government Tyranny and tagged "Bureau of Land Management", "Cliven Bundy" on April 17, 2014 by Shayn Roby. Shayn Roby’s Take: The Bureau of Land Management and Senator Harry Reid are guilty of government overreach and corruption. They backed down when exposed, but do not believe for a minute that these tyrants are afraid of a small band of protesters. We as Americans must continue to stand together against the criminal syndicate more commonly known as the Democratic Party. Federal government terrorists masquerading as Bureau of Land Management employees left a devastating trail of destruction on Bundy Ranch including the murder of two of Cliven Bundy’s cattle as well as destroying property as shown in the FOX news video below. Even the FOX news broadcaster correctly calls these BLM terrorists ‘rustlers’ as throughout the nation, a call goes out to disarm the Bureau of Land Management while others call to put them out of business completely by disbanding the rogue agency. This entry was posted in Agenda 21, Government Tyranny and tagged "Bureau of Land Management", "Cliven Bundy", Harry Reid on April 17, 2014 by Shayn Roby. Shayn Roby’s Take: Shamefully, the Obama regime feels it necessary to flex its domestic muscle against someone who raises cows for a living and feeds Americans rather than sending armed men to the border to protect our nation against cartels and the Mexican Army. Of course, with the track record of Barry’s Bureaus of arming Mexican cartels (Fast and Furious) with assault weapons, perhaps it is better that they stay as far away from Mexico as possible. 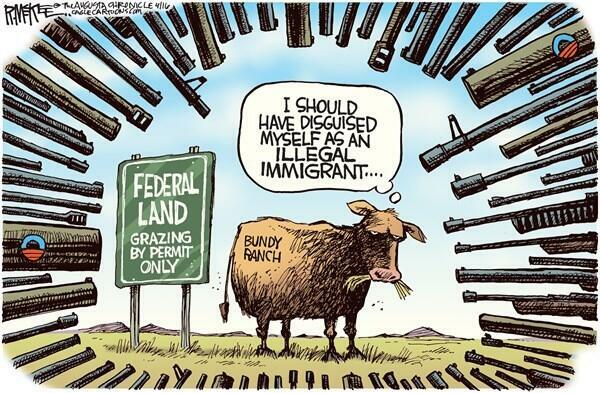 Nevada rancher Cliven Bundy’s decades-long battle against the federal government over grazing rights has brought to light the Obama Administration’s great land grab. We spend so much time on Obamacare and Benghazi, NSA, and IRS scandals that the area of federal land ownership often goes unnoticed. Not by Obama, however. This President is out to grab as much land as he can in many cases using the excuse of protecting endangered species as radical environmentalists hold the existence of animals above the existence of human beings. In Nevada they are using the Desert Tortoise as an excuse to seize 900 head of cattle so that the tortoise has more than abundant food and children in the US can have less. Feed the tortoise and starve the children. How nice. This entry was posted in Acts of Treason, Agenda 21, Government Tyranny and tagged "Bureau of Land Management", "Cliven Bundy" on April 14, 2014 by Shayn Roby.